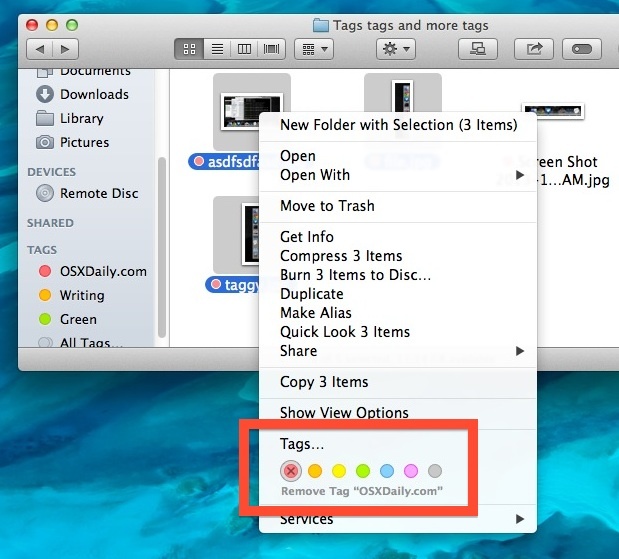 We showed you how easy it is to quickly add tags to Mac files and folders with the simple drag & drop trick, but what if you want to remove a tag from something? That’s equally easy, and we’ll cover two ways to remove a tag or multiple tags from items that currently have them: through a quick right-click action, or through the Finder toolbar. These two tricks actually work both ways, and you can use them to add new tags as well, but for this specific articles purpose we’ll focus on removing them. You can repeat this as necessary, and either remove additional tags this way or, of course, add new tags this way too. If you’re not a fan of the contextual menus and right-click / alt-click in Mac OS X, you can also choose a different and more granular approach through the Finder window toolbar. You can hit delete again to remove additional tags, or select another tag from that list if you want to add a new tag or change them. As mentioned already, these two tricks will work to add new tags, but for many situations the drag and drop to tag method is simply faster, particularly when working with large amounts of files. How do you know if something is tagged or not? 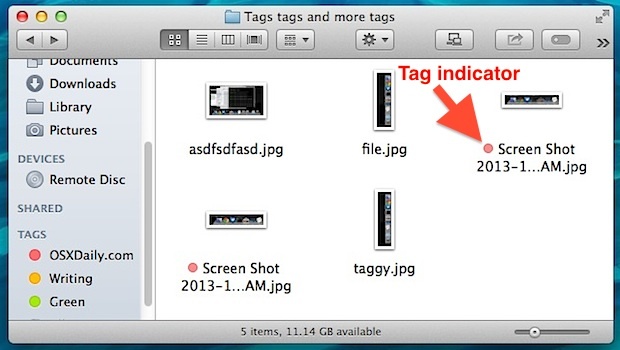 Identifying tagged files and folders is easy by a visual indicator: Tags are displayed in icon view as a colorful circle next to the file or folder name, thus removing the tag removes that little color circle. In list view, the tag / circle color appears after the file name instead. If no circle indicator is next to the file name, the file or folder is not tagged. Multiple tags show up as multiple concentric circles. There are two white tags available….is there any way to add colours to them? In Finder preferences click on Tags, right click on the tag and add color. What about tags that are “locked”? I have a few games that this method does not work. I tagged a file with a nasty word. Lets say ‘bass’. Now the tag as been saved on my mac and it shows up every time I want to tag something how do I remove ‘bass’ from the tag list so it doesn’t show up?? Is’t quite easy, but for only one tag per time though. So it makes it tedious to remove multiple tags from the list, but it seems to be the only option. To remove tags open Finder window select All Tags on the left hand side bar and choose the one you wish to remove with right click and hit Delete Tag. Strange thing, it doesn’t let you to select and delete several tags at one. This didn’t work for me. I couldn’t find “delete tag”. 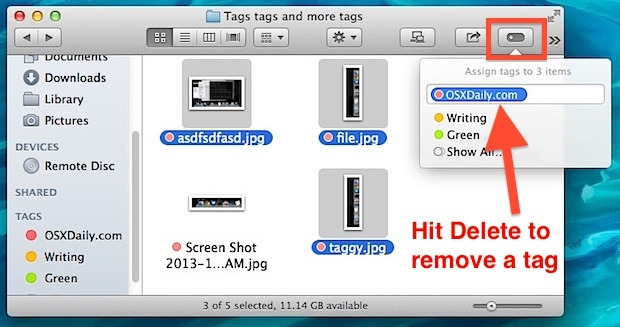 This works to delete a tag from a document but not from the list of tags on the finder menu. Perhaps more direction? I WAS ABLE to rename the tag though and that worked fine. I was trying to organize homework and decided on a different method and didn’t want all those extra tags in the way-renaming worked great! IN case you don’t see the reply below – rename the tag-it works! I had to press and hold my mouse pad to get the box to highlight but it works! I couldn’t delete them either. Grr. I’ve searched all over and can’t find out how to share tags globally among all users so that when tagging files on external drives all users have access to a global set. I would like to delete all colored tags. The tag “button” chokes if your tag name has a comma in it. It thinks you’re specifying two tags. You can use the right-click method to add to multiple files, though. Tagging in OSX El Capitan seems to be broken. I want to remove a certain tag from selected files (while keeping other tags). I go to tags and it says “Assign tags to 277 items” and shows list made by uniting all tags used within these files. I delete the tag I want to remove from these files. Finder tags each selected file with union of tags of those files instead of just removing the single tag. How can I remove a single tag only without changing the other tags?